Bamforth is a short road, less than a mile long. 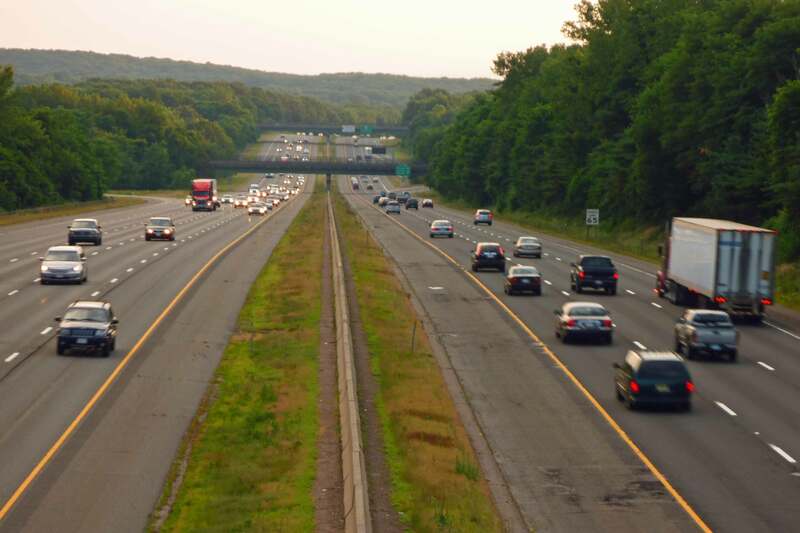 It begins at Route 30 and descends into the Tankerhoosen Valley ending at Bolton Road. It is an old road that is part of the connector from Rockville to Bolton. 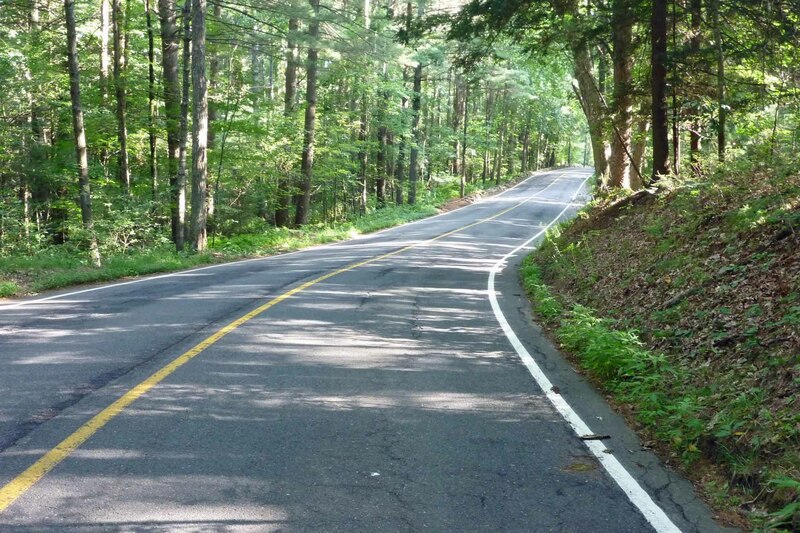 For such a short road it includes a number of interesting features and was designated a Scenic Road in December 2011. See Map. You can't see it from the road, but off to the left as you head south from Route 30 is a marshy area that is the beginning of CLARK'S BROOK. The brook passes under the highway and forms a private pond n the left just beyond Baker Road. Again you probably won't see it unless you are on foot, but just before you reach the crest of the hill the brook passes under Bamforth dropping down into the valley on your right and as it follows the highway and passes through the Industrial Park. The highway bridge is a good spot to appreciate how much of the Tankerhoosen corridor is still green. In both directions you'll see mostly trees although in places they mask housing and development just behind them. It's also a good place to dream on a late Sunday afternoon; imagining where everyone is going on vacation and what they will see on their journeys. They pass through the Tankerhoosen Valley but really don't see it. 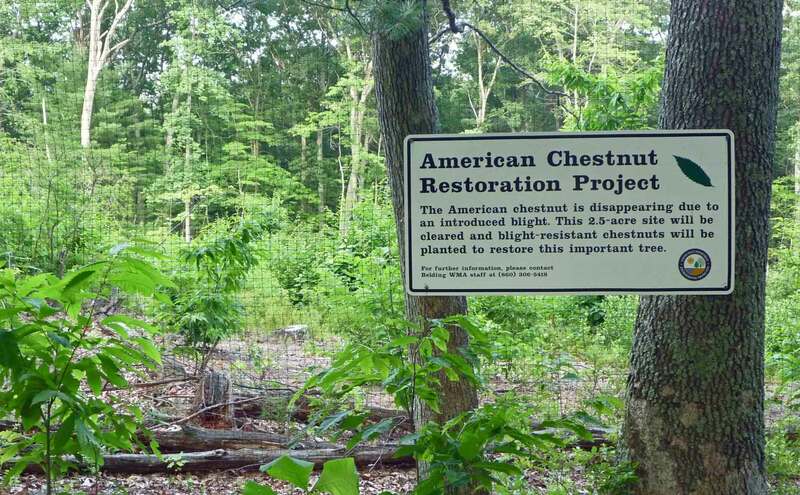 The AMERICAN CHESTNUT RESTORATION PROJECT is just past the crest of the hill on your left. This is a Habitat Project of the Belding Wildlife Management Area (WMA). The DEP, in partnership with the Connecticut Agricultural Experiment Station (CAES), introduced blight-resistant American chestnut trees to the Belding WMA in May 2009. The American chestnut was once a dominant tree of the eastern forests. It was an extremely valuable source of lumber as its wood is highly resistant to rot. In addition, chestnuts produce edible nuts that are an important food source for wildlife. Unfortunately, a non-native, imported fungus, discovered in New York City in 1904, spread quickly and decimated American chestnuts throughout their range. The blight cannot exist in the soil, so even though it kills the trees, it does not kill the roots. Many of these persisting roots continue to grow new sprouts, but the sprouts become infected by the blight and die before reaching maturity. This 2.5 acre site was cleared and 225 blight-resistant American chestnut seedlings were planted. A protective fencing was installed to prevent deer from feeding on the young trees. Because American chestnut seedlings require full sunlight, the overstory trees on the restoration site were cleared by a forestry contractor. As the planted chestnut trees grow, the oaks, maples, and birch will grow up with them, resulting in a more diverse forest. Just after the chestnut grove is the OLD BURIAL GROUND OF NORTH BOLTON. Buried here are some of Vernon's earliest settlers. 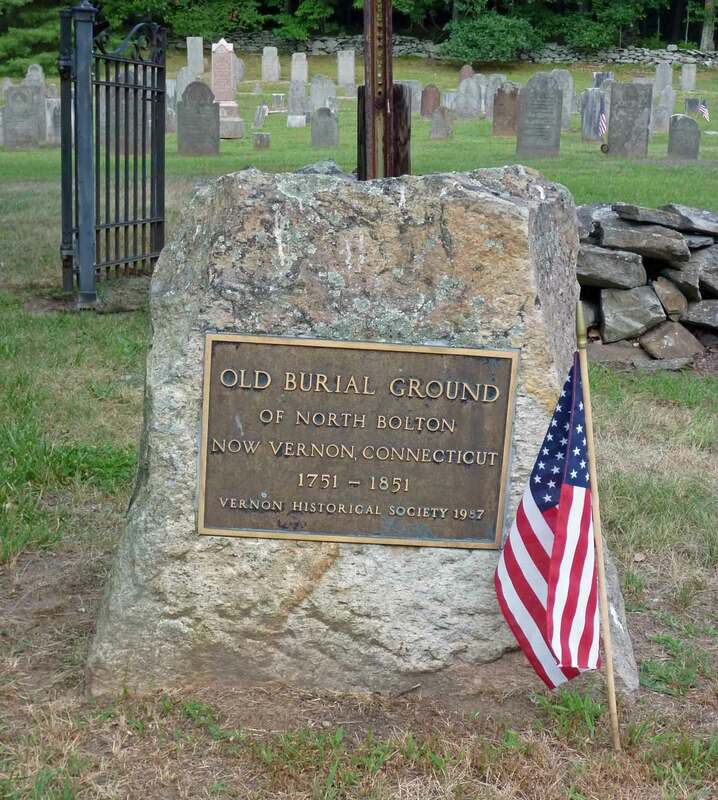 The cemetery was started in 1751 and closed a hundred years later in 1851. 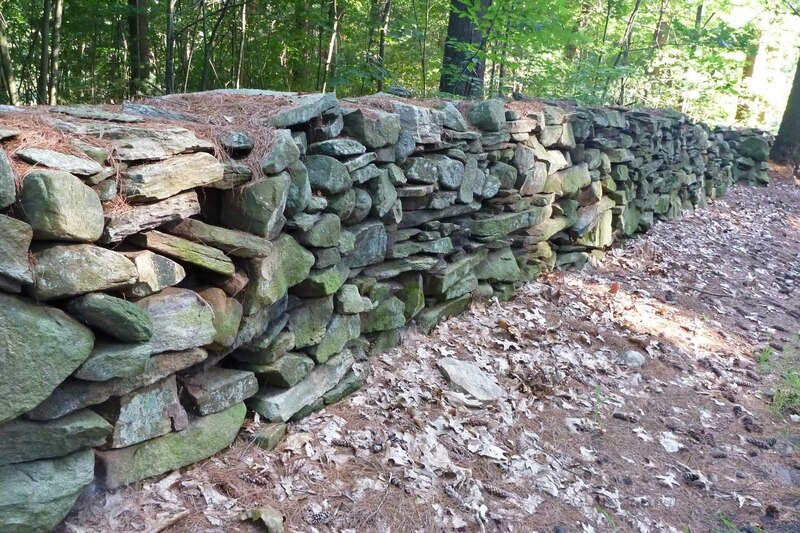 This is a beautiful spot to visit and just sit on the stone wall on a cool evening and enjoy the tranquility. The linked article provides information and more photos. Behind and beyond the cemetery is the BELDING WILDLIFE MANAGEMENT AREA stretching off across the valley. The Google map gives an idea of how much woodland has been preserved. The main entrance is further down the hill. 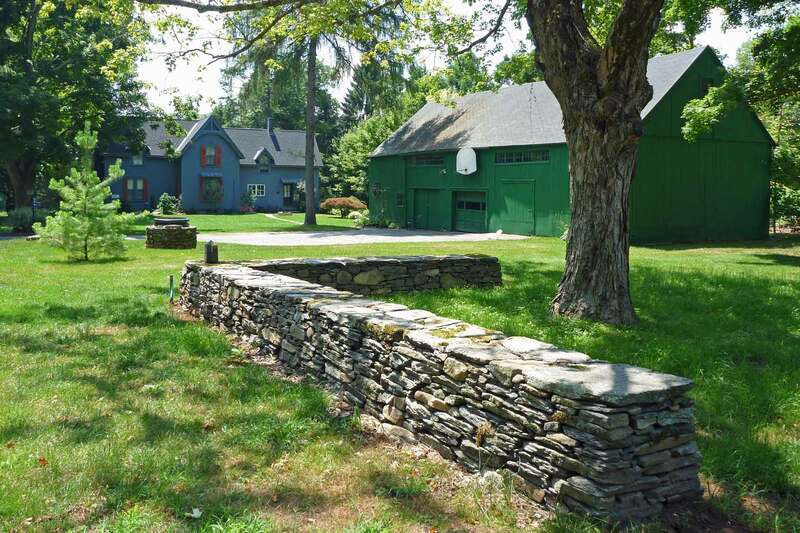 The Belding property and its stone walls continue on your left. Before 1980 the entire road south of the highway was forested creating an eerie atmosphere as you travelled past the cemetery on a late October evening. Near the bottom of the hill on the left is an old barn and on its right is an entrance to the Belding Wildlife Management Area near the dam and pond. 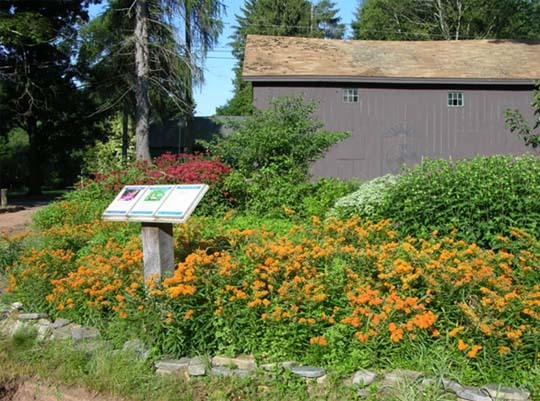 Just behind the barn is a BUTTERFLY GARDEN, another Habitat Project of the Belding WMA. Since there is no parking at this location people go by every day without realizing the garden is there, but its a perfect stop if you are walking or biking. The house on the corner and the barns were originally built and used by the BELDING FAMILY. Picture the buildings as part of a large farm and estate that included much of the Tankerhoosen Valley - Bread and Milk Road, sections of Bolton, Valley Falls and Bamforth Roads and the Tankerhoosen River from Reservoir Road to near Tunnel Road. The house on Bamforth Road was an easy journey over the hill and into Rockville where the family had other homes closer to the mills. The Beldings built roads through the woodland areas and would have enjoyed fishing in the Tankerhoosen River and hunting along its shores. A way of life long gone in Vernon, but because the land was held by one family it is now available for all of us to enjoy.